The Golden Rule, the storied sailboat that sparked a successful campaign to stop nuclear bomb testing in the South Pacific, is well on the way to going to sea again. Two years after a storm-battered relic was raised from Humbolt Bay in California, a crew of volunteers is working with experienced boat workers to restore the 30-foot wooden ketch and launch her under the flag of Veterans For Peace. The Golden Rule sailed into history in 1958, when a retired Navy commander, Albert Bigelow, and three other men set out from Hawaii to deliberately intrude into the US nuclear test zone in the Marshall Islands as a protest of exploding radioactive bombs in the Pacific Ocean. Their arrest by the US Coast Guard set off a wave of protests across America that prodded President Eisenhower to halt the testing and start negotiations with the Soviet Union that culminated in the 1963 Partial Test Ban Treaty that ended atmospheric nuclear tests. The sailboat is being restored at Zerlang and Zerlang Boat Yard in Fairhaven, CA. Boat yard owner Leroy Zerlang salvaged the ship and donated space for the restoration. “The Golden Rule showed up in Humboldt Bay 10 years ago as the property of a local doctor,” Zerlang told the Eureka Times-Standard earlier this year. “It sank in a big storm two years ago this month. After he raised the battered 30-foot hull from the bottom of the marina, Zerlang said, the boat nearly became firewood. During a visit to the boatyard on a vacation trip in July, I got an opportunity to see the work in progress. I was especially interested in the plank I’d purchased for $100 as part of a Golden Rule fund-raising swing through the East Coast that I encountered at the 2011 Clearwater music festival on the Hudson River. “Pick a plank!” Restoration Coordinator Chuck DeWitt said with a chuckle, sweeping a hand along the restored hull. I missed the “Whiskey Plank” party in March, when the last new plank was put in place. Still, I was glad to have made a small contribution that helped put the project’s phase one $50,000 fund-raising goal over the top. DeWitt, a Navy vet, and Champagne, an Army vet, clambered up the scaffolding and into the boat’s open innards to show off the new Yanmar engine that an anonymous veteran had purchased. The boat lies in a specially built boat shop, surrounded by salvaged and donated rigging, masts, sails and other parts. It is being restored as a project of Veterans For Peace Chapter 22 with the aid of other VFP chapters, other groups and individuals, including family members of the original Golden Rule peace crew. In a letter of support from VFP Chapter 61 in St. Louis, MO, chapter President Tom Tendler wrote: “We hope the Golden Rule may some day find its way up the Mississippi River.” Other chapters providing support for this project, and welcoming the Golden Rule to sail its waterways, range from San Francisco to Vermont. Plans are to have the ship seaworthy in time for the 2013 Americas Cup Yacht Races in San Francisco and then tour ports along the West Coast, Gulf Coast, East Coast, Great Lakes, and rivers and canals in the Mid-West. 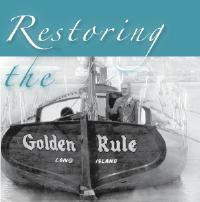 “The Golden Rule project is seeking regional volunteers to sail and to join the committee as the tour moves from one area to the next, and logistical and publicity assistance from local activists, especially from VFP chapters. Financial assistance is also welcome,” Champagne wrote in a recent article in The War Crimes Times. Interesting story about the Golden Rule. I hadn’t heard about the restoration. Any chance she’ll be sailed along the Iranian coast to protest Iran’s probable development of nuclear weapons and their stated intent to destroy Israel? Probably not, I’d guess. Well, and then this hardy little boat could sail along the coasts of the other nuclear weapons states–Great Britain, France, Israel, China–did I leave anyone out? A couple more nuclear weapons states — Russia and North Korea. Israel hasn’t conducted a nuclear test, far as we know, and does not confirm that they have nuclear weapons. Most folks think they’ve got them, though, which is just about as good as actually having them. North Korea has tested and claims to have nuclear weapons with some delivery capability. I’m not sure where the Golden Rule should be sent first. If we consider countries like the US and the UK to be morally equivalent to countries like North Korea and Pakistan (and Iran? ), then I guess the Golden Rule should spend equal time off the shores of all nuclear states. Of course, countries like NK and Iran are very likely to blow it out of the water, but I guess that’s the price you pay.